The morning of Friday, February 5, I got ready for work as usual. Before I left the house, I told Hubs to take a picture of me. I can’t remember exactly why I did it, but I’m glad I did because it’s the last photo of me pregnant and not in labor. It was a pretty normal work day, and then I taught prenatal yoga at 4:30 that afternoon. On the way home I stopped at Whole Foods to buy soup bones to make bone broth, which I wanted to have during labor/postpartum, but they didn’t have any. Hubs and I spent a low key evening at home watching The Good Wife and eating frozen pizza, until the aforementioned water breaking. I also texted our doula to ask how I would know if my water had broken, and she told me to put on a pad and see what happened. She also asked if I was having contractions, and I could feel my belly tightening if I put my hand on it, but I couldn’t feel anything else. I followed her advice and the pad was soaked within a few minutes, which suggested that it was definitely my water and not pee. We got in bed and tried to sleep. Pretty soon after, though, I started having contractions. I didn’t know they were contractions at the time because the tightness was so low in my abdomen and not in my back at all (I thought they might have been rhythmic gas pains-ha!). But in any case, the tightness was happening at regular intervals. I took a benadryl to try to facilitate sleep, and then went back to bed. About 2 am, after not really having slept, the contractions were too intense to stay lying down. I texted our doula to confirm that I was having contractions as well as bloody show and phoned the birth center to page the midwife on call. When the midwife called back, she suggested I take a bath, eat a snack, and take another benadryl. I made peanut butter toast and got in the tub. My contractions immediately got closer together, and I started moaning/om-ing through them, which I kept up throughout the rest of my labor. When I got out of the tub, I threw up the peanut butter toast (yuck) and then took another benadryl and tried to sleep on our couch. I dozed on and off through contractions from about 4-6 am and then got up. I walked the dog and then proceeded to labor around the house while moaning/om-ing through contractions and getting some things ready to go. Hubs got up a little before 7 and sprang into action as well. We hadn’t packed any bags, didn’t have any food to take with us to the birth center, and didn’t have the car seat in the car. I was able to pack a bag for Plum and me in between contractions, and Hubs did the car seat installation, found a dog sitter, and grocery shopped. He also kept encouraging me to eat (some oatmeal, which I also threw up) and drink juice and water. Our doula came by around 10:30 am and suggested some position changes for me to try. She also turned off the lights and lit some candles to make the environment cozy. The student doula that was working with our doula came over, too. They kept me company, encouraged me, and reminded me of my labor mantra (“I’m gonna get huge”) while Hubs finished up preparations, and they also kept track of how close my contractions were. Because we live so close to the birth center, the midwives had told me not to come in until my contractions were 2-3 minutes apart. About 12:30 pm, our doula said it was time to think about heading to the birth center. We threw everything in the car and then I got in the backseat on hands and knees, using the newly installed car seat as a support. I had two contractions on the six minute drive, which were not my favorite, but then we were there. No one else was laboring at the birth center, so we had our choice of the three birthing rooms, as well as the undivided attention of the midwife, student midwife, and nurse. Throughout my pregnancy, I’d had high-ish blood pressure at all my prenatal visits, in spite of mostly normal BP when taking it at home, so it was a slightly tense moment when they took my BP that day. I knew that if it was anywhere close to too high, I might have to transfer to the hospital. Luckily, it was well within the normal range (and lower than it had ever been for the midwives! ), so we got to stay at the birth center. They also took my temperature and did a cervical check. I was about five centimeters dilated at that point. For the next several hours, I just labored in different places around the birth center, vocalizing all the way: the tub, the toilet, a birth ball (which I hated), walking around, and the shower. I was in the shower for about 30 minutes, and it felt amazing to me to use the handicapped handle bars to go into a deep squat during contractions, while Hubs used the shower head to spray warm water over my back. In between contractions, I stood up and swayed my hips. I knew that the contractions while I was in the shower were longer and more intense, but I never felt as though they were beyond the limits of my coping skills. Around 4 pm, I got out of the shower and had another cervical check. I was completely dilated and at about +1! I got on the birth stool at that point because I thought I wanted to be there to push. I started to feel a little bit as though my body was pushing for me, so I started to push. And I pushed and pushed and pushed. At first, I didn’t mind because my contractions had gotten further apart and shorter, but it became clear pretty soon that I wasn’t making much progress. In contrast to the capability I felt breathing, moaning, and laboring through contractions, I felt pretty unprepared for pushing. For me it was completely different because I had to hold my breath and direct it downward instead of using my breath and being able to blow the pain out. Plus, even during contractions I got a break, but when I was pushing and things were just stretching, it just hurts the whole time. About two hours in (I actually didn’t know that it had been two hours) and after several position changes (birth stool, hands and knees, side-lying on both sides, reclined/supported on pillows), I started to get pretty whiny and asked if someone would help me get the baby out. The midwife felt me do a push and then coached me a little bit, instructing me to push harder and to maximize each contraction with several pushes. From that point, I was much more effective, and I could feel actual change and movement. But I was still pretty whiny and talked a lot about how hard it was and how much it hurt. The lovely thing is that even though I know I was probably pretty annoying, my birth team was nothing but supportive and wonderful. They monitored Plum’s heart rate, which stayed great pretty much throughout pushing. And they said things like, “Yes, it’s so hard, and you’re doing it,” and put cool cloths on my head and gave me drinks of lemonade. At one point the student midwife gave me a little bit of tough love and said something along the lines of, “It’s hard, but the only way for it to stop is to push your baby out, so do it.” And so I did. 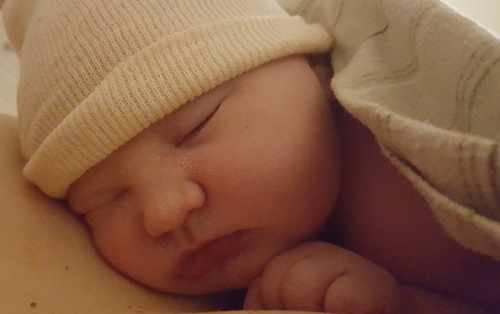 Plum came earthside at 7:53 pm on February 6, 2016. After the student midwife delivered the head and shoulders, Hubs pulled Plum out the rest of the way, and as he brought our baby to my chest, he said, “We have a daughter.” I was so surprised that she was a girl and so glad to be done pushing and have her with me. She didn’t cry right away, but I never felt worried because she was looking right at me. They suctioned her mouth a little and then she cried a big cry. We waited until her umbilical cord stopped pulsing and then Hubs cut it (her cord was so big that they thought for a minute they would need a bigger clamp, but that didn’t actually end up happening). She and I did skin to skin for a while and then I got stitched up (second degree tear) while she and Hubs did skin to skin. We spent the night at the birth center and headed home the next morning, where we’ve been enjoying each other ever since. I am so thankful that I was able to birth Plum pretty much how I’d hoped I could. I felt so incredibly supported and empowered and safe in the birth center setting and with our birth team. What an incredibly sweet and powerful way for Hubs and me to welcome Plum!